The CBSE Class 10 students will be writing their English paper tomorrow, 23 March, 2019. Examination for both English (Communicative) and English (Language & Literature) papers will be conducted between 10:30 AM and 01:30 PM. In CBSE Class 10 English paper, letter writing is considered as one of the most important questions as students can easily score full marks in this question with a little preparation. However, there is no particular study material or books to learn this question but students just need to understand the correct format according to which the information is to be penned down. We will explain here some important points along with the correct format to be considered while writing a letter in the CBSE exams. 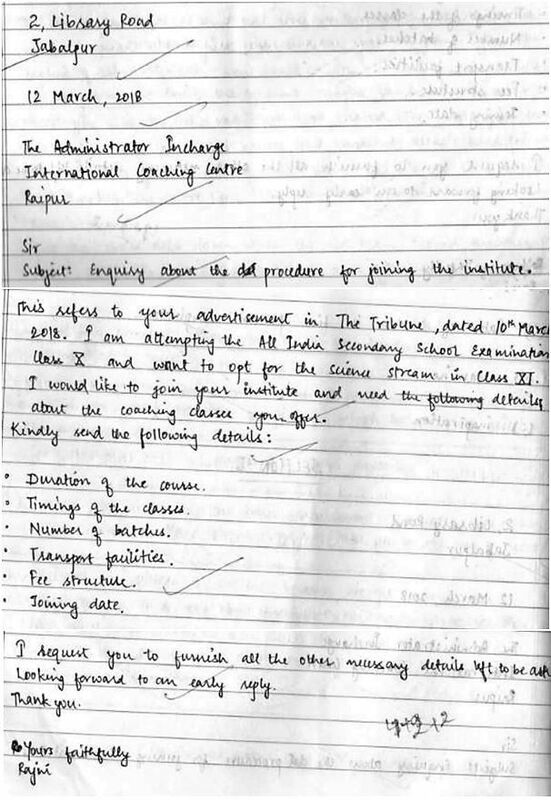 In CBSE Class 10 English paper letter writing question carries 8 marks and comes with an internal choice. Expressing your views about child labour, unemployment, crime against women, habits of smoking, problems arising due to increasing population, drug addiction, etc. Pointing to the rash driving by the DTC drivers, over speeding by bikers etc. Regarding some products that you purchased, like defective mobile handset, camera, etc. Regarding problem faced in society like shortage of water, frequent power break down, etc. Placing an order for school uniforms for dress store of school. Placing an order for books for the school library or other educational purpose. Placing an order for sports items for your school team. For placing orders for some eatables for your birthday party or any other event. Asking about the details for taking admission in a course. Enquiring about some welfare schemes launched by the government. Writing to a tourism company to enquire about the details of some tour package. 1. Sender’s address: On the left side of the page, just next to the margin, write the sender’s address/ contact details. 2. Date: Below the sender’s address write the date after leaving one line. 3. Receiver’s address: After date, write the address of the recipient (the Officer / Principal / Editor). 4. Subject of the letter: Here you have to mention the main purpose of the letter in 4 - 5 words. First Paragraph: Introduce yourself and the purpose of writing the letter in brief. Second Paragraph: It should include the matter in detail. Third Paragraph: Here you have to conclude your letter by mentioning the conclusion or solution. Question: You intend to join coaching classes at International Coaching Center situated in Raipur. The institute specializes in teaching science to classes XI – XII. Write a letter of enquiry in 100-120 words addressed to the Administrator incharge of the institute seeking clarification about the timings, duration, staff, transport and other necessary details for joining the institute. You are Rajesh/Rajni 2, Library Road Jabalpur. Under content, credit should be given for the candidates’ creativity in presenting ideas.